Jim was born in Sheffield but has lived in Lancashire since the age of ten. He began conducting in 1978 whilst at college in Liverpool, rehearsing the wind band and later forming a student orchestra to perform concerts of light music, thus developing a broad ranging interest in repertory. Jim studied for his PGCE at Didsbury College of Education and MA at Liverpool Hope University. He conducts the Orchestra of Ormskirk Music Society (since 1992), Parbold Chamber Choir (since 2007), Manchester Bach Choir (since 2009) and is an honorary member of the Royal Liverpool Philharmonic Choir since 1988. 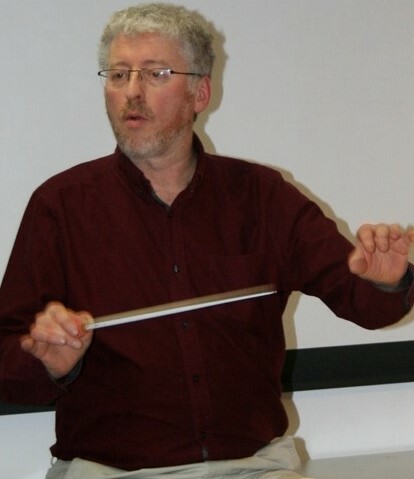 Jim is a member of the Light Music Society, the British Music Society and Lakeland Composers. As a composer he has had pieces recorded on two commercial CDs: Concert Jig on Dutton Laboratories' "British Light Music Premieres Volume 4", and When it's Christmas Time Once More on the Royal Liverpool Philharmonic's "Spirit of Christmas" album. Jim regularly arranges choral pieces for performance. In his spare time when he is not thinking about music, Jim enjoys walking.